Use our Branded Caja China to create your brand's successful Summer Sweepstakes. create your brand's successful Summer Sweepstakes. 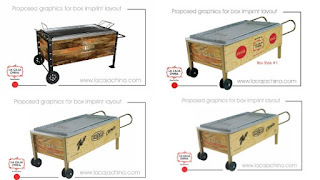 Watch this video, to see how easy is to assemble a La Caja China. Visit www.lacajachina.com for more information. Where Can You Use Your Adobo Criollo Seasoning? Adobo is a Spanish term that came from the root word "adobar" which refers to a marinade, a sauce or a seasoning that's used to flavor and preserve food items. Though this food preparation originated from Spanish and Portuguese communities, it cannot be denied that Adobo is equally popular in other parts of the world including Latin America, the Philippines, and the United States. The Adobo Seasoning is usually composed of powerful spices such as oregano, salt, garlic, bay leaves, cumin. Today, there are a lot of other variations of adobo rub, marinade, and sauce recipes. For instance, lemon and sour orange are used as substitutes for sour vinegar. To give the seasoning a kick, hot pepper, and black pepper are added into the mixture. The amount of garlic and onion content also varies depending on personal taste and preference. Now the main question is, where can you use your Adobo Seasoning? Well, a lot! It's so flexible and adaptive to different recipes that you can almost make any food even more delicious with it. The adobo rub is an excellent seasoning for grilled food items. Simply rub your choice of meat (pork, beef, pork chops, ribs, and even your chicken) before cooking them on the grill. If you combine the rub with citrus juice or olive oil, you can also use it to marinade your shrimp and kebabs. Aside from barbecues, the adobo seasoning is also perfect for giving your soups, chili, stews and even popcorn a twist. We all love our pica-pica! You know, finger foods that we seem to never get away from during cocktail parties or movie nights. Among the most favorite dips, we use for our chips include the popular guacamole and salsa. Yes, you can add adobo seasoning in these, too. Here is our family recipe for the La Caja China "Adobo Criollo" to enjoy it when cooking on any of our La Caja China roasters. This adobo is great add-on on any type of meat or burger, this is the recipe that both my grandmother and mother would use every day to season all the meats. Mix together all ingredients in an airtight container; cover and let stand at least 12 hours before using. This Adobo Criollo is great with any cut of meat including chicken and burgers.